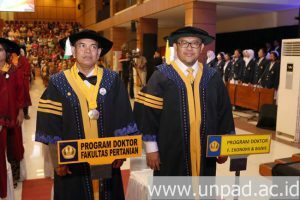 [unpad.ac.id, 07/31/2018] Rector of Unpad Prof. Tri Hanggono Achmad inaugurated 2266 graduates at Graduation Batch IV of Academic Year 2017/2018. 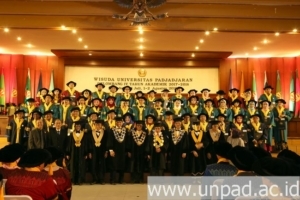 The graduation ceremony was held in five sessions at Grha Sanusi Hardjadinata Unpad, Dipati Ukur St. No. 35 Bandung, Tuesday (31/7) to Thursday (2/8). 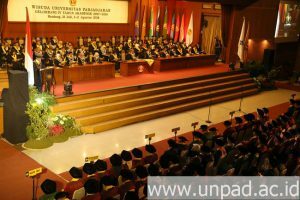 To the graduates, the Rector advised to always maintain the good name of Unpad. 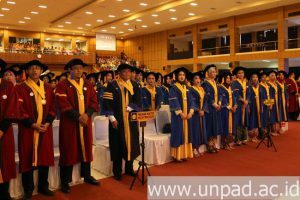 Graduation is not only the addition of a title in front of or behind the name, but is an academic legitimacy that can give new strength to graduates to be able to contribute better, stronger, and bigger in the community. 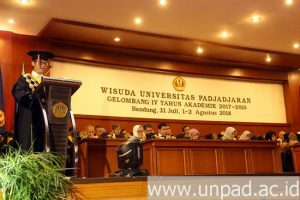 “Be smart scholars who always bring benefits everywhere you do according to their respective fields of knowledge,” the Rector ordered. 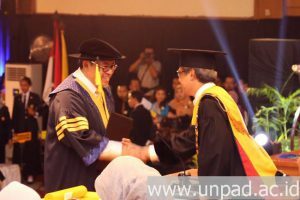 In particular, the Rector also congratulated the graduates with the best title for each level. 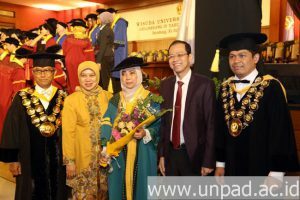 The best graduate of the Doctoral Program was achieved by Muhammad Alishahdani Ibrahim from Public Administration Doctoral Program while the best graduate of the Master Program was reached by Umi Baroroh from the Biotechnology Master Program, and the best graduate Specialist Program was seized by Ulfa Yasmin from the Children’s Dental Health Study Program. 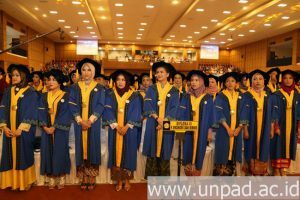 The best graduate of the Professional Program was obtained by Elizabeth from the Dentistry Study Program, the best graduate from the Bachelor Program was achieved by Nadya Puspita Dewi from the Nursing Study Program, and the best graduate from the Diploma Program was achieved by Louis Freedyana Anggryani from the Public Relations Study Program. 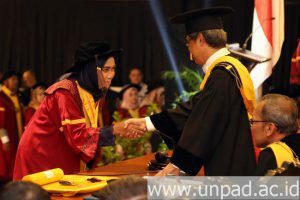 Meanwhile, the oldest graduate at this graduation was Hermanto Dwiatmoko from the Doctoral Program in Economics at the age of 62 years old, and the youngest graduate from the Undergraduate Program was Nimas Tika Inas Tarina from the Pharmacy Study Program at the age of 20 years 1 month 20 days old. 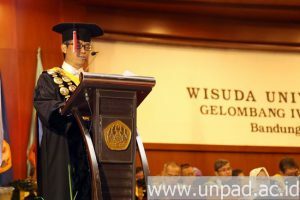 In his speech, the Rector also revealed that the educational process at Unpad was not only aimed at producing individuals with degrees, but essentially created and produced future leaders who acted as human servants of the nation building who were able to work in various sectors, have excellency, and can have a positive impact and benefit for humanity. The Rector also quoted the statements of Otto Scharmer and Katrin Kaufer (2013) regarding U-Theory in their book entitled “Leading from the Emerging Future”. It is stated that the character of the future leader is a person who is able to have an impact and change the perspective from the ego-system to the eco-system. The leader, should not only strive to achieve the goals of the group or organization, but also must lead to the achievement of the welfare of humanity throughout the world. Specifically, there are 7 main leadership capacities needed in the future, namely listening, observing, sensing, presencing, crystallizing, prototyping, and performing.